Indian Coast Guard has released the result of Foreman and Storekeeper Exam 2019.Guard Foreman and Storekeeper Exam 2019 was conducted on March 4, 2019, at CGSB Noida. The candidates who took up the test can can check their result on the official website of Indian Coast Guard. 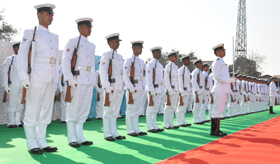 Indian Coast G Indian Coast Guard Foreman and Storekeeper Result 2019 have been announced at Join Indian Coast Guard Official Website. 1) Log on to the official website– joinindiancostguard.gov.in. 2) On the homepage, Click on Indian Coast Guard Foreman and Storekeeper Result 2019. 4) Candidates can check their name and roll number wise result in the PDF. 5) Download the PDF and take a print out of the same for future references.